One serious headache most chick raisers face is the issue of early chick mortalities. Why is it that a lot of your chicks usually die? What are the possible causes and how can you avoid them? In this article, I’ll be answering all these questions. You’ll probably discover some common mistakes chick raisers usually make. Now let’s look at how you can successfully avoid early chick mortalities. Early chick mortalities are caused mainly by E. coli and staphylococcal infections (1). To prevent this, give your chicks Gentamicin injection at Day Old (2). You can get a vet to do it for you. Temperature control is very important for chicks, especially during the first 3 weeks of life. However, chicks will continue to need warmth until about 6 weeks of age. After 6 weeks, heat may or may not be required depending on the environmental temperature. If it’s too cool, you have to continue providing heat. Below are some negative effects of high and low brooding temperatures. 1.a. Dehydration:The chick’s body is about 70% water. When brooding temperature is high, there is loss of water from the chicks’ body. When about 10% of water is lost, the chick will die from dehydration. b. Vent Pasting: When temperature is high, feaces will continue to stack around the vent until the vent is blocked. If this is not attended to, the affected chick will die. a. Chilling:This is also called brooding pneumonia. When chicks are chilled, their lungs will turn blue and they’ll die. It can also lead to failure of the digestive system. b. Smothering:When temperature is low, chicks will huddle together for warmth. They may pack themselves so tight that some will die as a result. To prevent all these problems discussed above, you need to have a very reliable source of heat, which might be infrared heat lamps, propane gas brooders, bulbs, kerosene lamps etc. 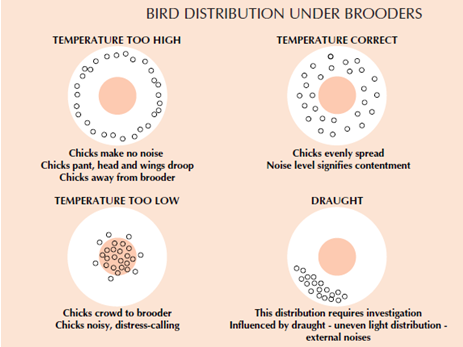 Also follow the recommended temperature plan for chicks, like the one shown in the table below. However, you should adjust these recommended temperatures according to chicks’ behavior. If the temperature is ok, they’ll be evenly spaced around the pen and will make soft cheeping sound. Cold chicks will huddle together and cheep loudly. If it is too hot, they’ll move away from the heat source and they may pant and/or lay down with wings stretched out. If there is draft they’ll stay away from its path. Monitor all these and correct the temperature accordingly. Another important thing to note is the litter temperature. If the litter is not warm enough, the birds will loose heat when they lie on it. To avoid this, you have to put on your heat source 24 hours before the chicks arrive. This way, the litter will be warm enough when they arrive and you’ll be able to measure and see how high or low the temperature swings during the day and at night. Also remember to measure the temperature of areas furthest away from the heat source. This will enable you to know how to make adjustments so that birds in these locations will not get chilled. Note: You can use a digital max-min thermometer to record the maximum and minimum temperature in the brooder. Some can also record humidity. Fungal and other toxic contaminants in feed can also cause mortality in chicks. If there is excess salt in the drinking water, death can result from that. Prevention: Monitor your feed and water quality. Buy feed from reputable companies and send a water sample for test – chemical and biological test. If you mix your own feed, use feed ingredients that are free from toxins. Also incorporate toxin binders in the feed. Always ensure that feed and clean water are constantly available. Starving the chicks any of these will result in mortality. Chicks don’t have fat storage and so can’t cope with hunger. There should be enough feeders and waterers for the number of chicks you have. Linear feeding space for the first 2 week should be about 1 inch per chick, then 2 inch/chick after 2 weeks. Provide two 2-gallon waterers for 100 chicks from 0-4 weeks old and two 5-gallon waterers from 4-12 weeks old. Toxic gases like ammonia, carbon monoxide (CO), high concentration of carbon dioxide (CO2) etc. can lead to mortality. Ammonia gas is produced as chicks’ droppings decompose. It will build up in brooders with wet litter and poor ventilation and lead to respiratory infections. Its maximum concentration should be less than 25 ppm. CO is a very lethal gas to both humans and animals. It is produced during low oxygen combustion. CO is particularly important to those that use charcoal fire in brooding. Both CO and CO2 can lead to death by suffocation. Prevention: Good air quality can be ensured by proper ventilation. Some people think that because chicks need warmth, they have to seal up the brooding house. This is wrong because if toxic gases from the litter and heaters can’t escape, they’ll cause problem for the chicks. So, every brooding house need small openings at the top to ensure that fresh air continually comes in and bad air out. This will prevent draft and ensures good ventilation. Draft occurs when air flow comes in direct contact with the chicks while with ventilation, the air flow does not come in direct contact with the birds. Draft can chill and kill chicks. Draft during cold periods can kill adult birds. To prevent ammonia build up, ensure that the litter remains dry. The litter should be about 3cm thick. Stir it from time to time to keep it dry. Remove any wet spot and caked litters and replace with dry ones. It is good to give chicks and even adult chickens vitamin supplements routinely. Give it to them whenever they are stressed with temperature swings, transportation, breeding, illness, vaccination etc. This will boost their immune system and help them to cope better with the stress. However, giving multivitamins for a long time at a stretch is not a good practice because of the dangers of vitamin toxicity. Follow the instruction on the multivit’s sachet while giving it to them. If the instruction says give for 3 days at a certain dosage, abide by it. Where to Buy Multivitamins: You can get a wide range of cheap poultry vitamins on Amazon. Probiotics are the opposite of antibiotics. While antibiotics kill bacteria - both good and bad bacteria - probiotics add and encourage the growth of good bacteria in the gut. Probiotics can also be given during an antibiotic treatment to help replace the good bacteria killed by the antibiotic. Where to Buy Probiotics:You can get a wide range of cheap probiotics on Amazon. Birds need vaccination against many diseases, including incurable viral diseases like Newcastle, Marek’s disease, Gumboro, infectious bronchitis etc. Most often, viral diseases are accompanied by bacteria diseases. This is why antibiotics can be given to birds suffering from viral diseases. In such situations, the antibiotics are not meant to treat the viral infection, but to treat the bacterial diseases and help reduce the severity of the disease. Viral diseases can only be prevented through vaccination. Some vaccination like that against Marek’s disease is given at day old in the hatchery. Make sure you buy chicks that have been vaccinated against Marek’s disease at the hatchery. You’ll have to contact a vet doctor who will help you with a vaccination plan suitable for your area. Failure to vaccinate will expose your birds to a lot of bacterial and incurable viral diseases. Better still, go to an animal lab and conduct day old chick screening test. From the test, a proper vaccination plan can be drawn out. Suitable antibiotics will also be recommended. After 7 days, all birds require a period of darkness so as to avoid metabolic diseases (esp. of the heart) and leg problems. Initially, the birds may be exposed to 23-22 hours of light for the first 3-5 days to enable them find their feed, water and warmth. However, the chicks should be given blackout training from a day old to avoid death. Blackout Training:Chicks should be given blackout training from day old in order to accustom them to sudden darkness. It involves turning the light off for about 5 to 60 minutes daily. Without this, the chicks will likely die in pile-ups on the litter if a blackout occurs. When chicks are overcrowded, disease organisms can easily build up and spread fast, leading to deaths. Overcrowding can also lead to mass death when they pile up and die from suffocation. This usually happens when they’re frightened. Space required per bird depends on the climate (temperate/tropics), type of housing (deep litter, cage, slatted floor) and age of the bird. Chicks should be given at least 0.05m2/bird (0.5ft2/bird) during the first 3 weeks. Increase to 1ft2/chick from 4-8 weeks. 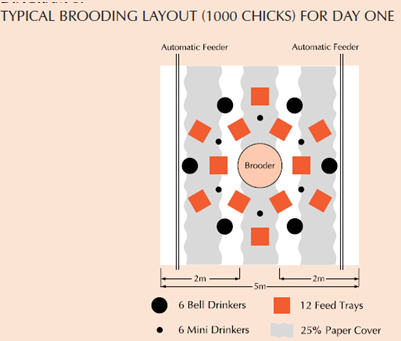 A brooder ring with a diameter of 6 feet will cater for 50 chicks. 10. Smothering in Corners: When you remove the brooder ring, chicks are in danger of piling up at any of the 4 corners of the pen when frightened. A lot of chicks can die that way. To prevent this, block the corners of the house with cardboards or wire mesh. Having said all these, it is important to let you know that it is normal for some chicks to die. During the first 3 weeks, it will be normal if 2% of your baby chicks die. In turkey poults, it is 3% (5). If mortality is greater than this, you may have to worry and find out why. After 3 weeks, normal mortality rate should not exceed 1% per month; however, you should expect something higher when the birds start laying eggs (for layers). I hope that you’ve now understand why chicks die, what causes deaths and how can you avoid them. For more such information, register at FarmersJoint.com. It’s a blog and forum where you can get interesting info on everything farming – chickens, goats, rabbits, cattle, grasscutters, snails etc. Ask any question you have in the forum section and join in farming discussions. 1. Naxcel. Naxcel. [Online] [Cited: October 9, 2014.] http://www.naxcel.net/naxcel.aspx?countr...NX&sec=310. 2. Drugs.com. Drugs.com. [Online] [Cited: October 9, 2014.] http://www.drugs.com/vet/gentapoult.html. 3. Aviagen Limited. Download Ross_Broiler_Manual_09.pdf. Aviagen.com. [Online] Nov. 2002. http://en.aviagen.com/assets/Tech_Center...ual_09.pdf. 4. Gietema, Bart. Download EM-32-e-2005-digitaal.pdf. cd3wd.com. [Online] 2005. http://www.cd3wd.com/cd3wd_40/lstock/001...gitaal.pdf. 90 5285 006 2. 5. McCune, E. L and Vandepopuliere, Joseph M. [Online] University of Missouri Extension, October 1993. [Cited: October 11, 2014.] http://extension.missouri.edu/p/G8904. 6. Download 2009_Hy-Line_Brown.pdf. PoultryHub.org. [Online] March 2011. http://www.poultryhub.org/wp-content/upl..._Brown.pdf. 7. N. van Eekeren, et al. Downlad AD4.pdf. Journeytoforever.org. [Online] 2006. http://journeytoforever.org/farm_library/AD4.pdf. Agromisa: 90-8573-069-4. 8. Poultryhub.org. [Online] [Cited: 08 3, 2014.] http://poultryhub.org/production/husband...try-houses. 9. Aviagen.com. [Online] November 2002. [Cited: October 20, 2014.] www.aviagen.com.